Like a quiche, a frittata or a pasta salad, a pressed sandwich has endless possibilities and permutations and computations out the wazoo for creative composition. And it never fails to impress. And it’s certainly not complicated; it’s pretty much an assembly job. All you need is a variety of deli meat (or not) and cheese, a couple condiments, a nice loaf of bread, and a brick. Thankfully, you don’t eat the brick. (That only happens at my house if I try and make bread.) I have heard this sandwich even called a brick sandwich, but since the first time I made it a few years ago from a Martha Stewart recipe, I’m sticking with Martha’s christening of it. There really are no rules with this, just a few cautions: You need a firm loaf of bread; a fluffy loaf won’t stand up to the oil and the pressure of the weight and the ingredients. And the wetter ingredients, like a roasted pepper, need to be patted dry. Other than that, you only need to choose your weapons. Aside from your choice of main ingredients, variations could include olives, anchovies, artichokes, tapenade, pesto – you get the idea. I'd like to try roasted eggplant. When the sandwich is weighted down with the brick (foil-wrapped, mind you) all those flavors have no choice but to get cozy. 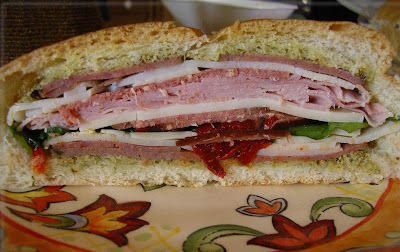 The result is a dense, intense sandwich in which the flavors and juices meld wonderfully. Depending on how thick or thin you slice it, the sandwich can be an appetizer or a meal. It’s great for picnics, since there’s no mayo involved. And it’s pretty easy to tote. And if you don’t have a brick handy, a couple of heavy cans or a Dutch oven or something else heavy will do the trick. 1. Slice the ciabatta lengthwise through the center to split the loaf into halves. Pull out most of the soft insides of both halves and save for breadcrumbs. 2. Brush each half with the olive oil. 3. Arrange the basil or spinach on the bottom of the loaf. Then arrange the red peppers on top. Top the peppers with the turkey, then half of the provolone cheese, the pastrami, the ham, the salami, then the remaining cheese. 4. Top the sandwich with the other half of the bread, then wrap it tightly in plastic wrap. Set the sandwich on a large platter or plate, then carefully a foil wrapped brick (or other weight) and refrigerate for at least 2 hours, preferably overnight. 5. When ready to serve, unwrap the sandwich and cut crosswise into slices. 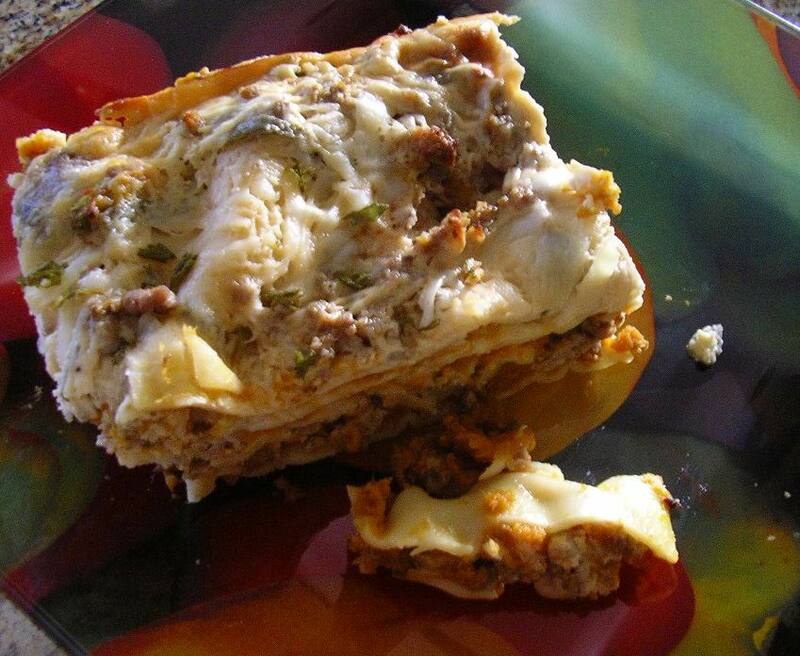 Whenever someone asks me what my favorite cuisine might be, I invariably answer, “Italian!” I do love Italian food, and the usual suspects – lasagna, tetrazzini, cannelloni -- are on our traditional favorites list. In fact, a pan of shells stuffed with ricotta and spinach with a slow-simmered homemade meat and mushroom sauce is baking in the oven right now. But I don’t very often veer off my self-induced safe path when cooking at home. So every once in a while, I decide I’ll try something new Italian! My target was panzanella. All I really knew about panzanella before I started reading that it’s basically a salad made with stale bread and fresh tomatoes. I opened up a little can of worms! To be truly authentic, I learned, the bread in panzanella, which is considered a Tuscan dish, is soaked in water for a few minutes, then shredded. Other marks of authenticity are anchovies, capers, and basil. Some recipes included cheese, either mozzzarella or Parmesan. But most of the recipes I consulted for my base – I knew I’d want to change something – called for toasting bread cubes. What a quandary! Do I try and stay authentic or do I follow the pack? How a recipe, or rather good cooking, evolves is all about change. It’s not changing something or adding a personal imprint just for the sake of individuality; it’s accommodating individual tastes and making good use of what’s available. One thing I’ve always admired about Italian cooking is the lack of waste – everything is put to use or reprised in a new role. 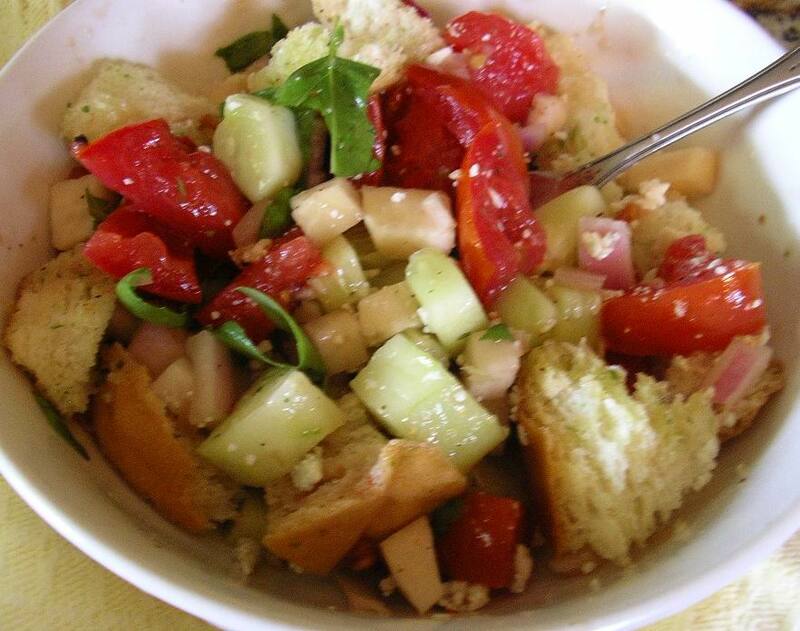 So this “panzanella” is not authentic; it’s an amalgamation of all that I read. It is important not to soak the bread so it either has to be really stale or toasted before you toss the salad with the dressing. I added kohlrabi, even though that’s certainly not traditional. (It was going to go to waste if I didn’t use it soon.) And I added a cucumber, too, because a neighbor had just given me one. The kohlrabi gave an nice extra crunch to the salad. I sneakily put it in. My husband had to ask, “What’s the crunchy stuff? It’s not celery.” So I had to fess up. Preheat oven to 400 degrees. In shallow baking pan, toss bread cubes with 1 T olive oil to coat. Bake about 10 minutes or until toasted, stirring once. Remove and cool on pan. Just before serving, add bread cubes and basil to tomato mixture; toss to coat. In large serving bowl, combine tomatoes, red onion, yellow sweet pepper, kohlrabi and cucumber. To make dressing, combine the olive oil, vinegar, mustard, Italian seasoning, salt and pepper in a food processor). Add to tomato mixture and refrigerate overnight – up to 24 hours. Makes 6 to 8 servings. Not even the most ardent of us really enjoys cooking in a heat wave. Having a cole slaw like this that just needs to cook in the fridge is a blessing when the hazies, hots and humids are just too much. And since there's no mayo involved, it's great for a picnic, too. I got the recipe for this at a potluck dinner several weeks ago, the only requirement of which was that your dish be, if not grown yourself, at least locally grown. The array of foods was wonderful. Lots of fresh fruits and vegetables and salads. We took blueberry muffins, from our own blueberries, of course, and a crustless quiche made with neighbor Dude’s farm eggs and my own spinach. My husband raved about this salad. I'm sure it must have Pennsylvania Dutch origins. So we asked for – and got – the recipe. Since that dinner I’ve made it a couple times. It “ages" quite well and will keep several days refrigerated. My husband likes anything with cabbage, really. Sauerkraut, stir fried with kielbasa, in a vegetable soup, in eggrolls. And any kind of cole slaw. Creamy. Vinegary. Doesn’t matter. This particular salad was a big hit. 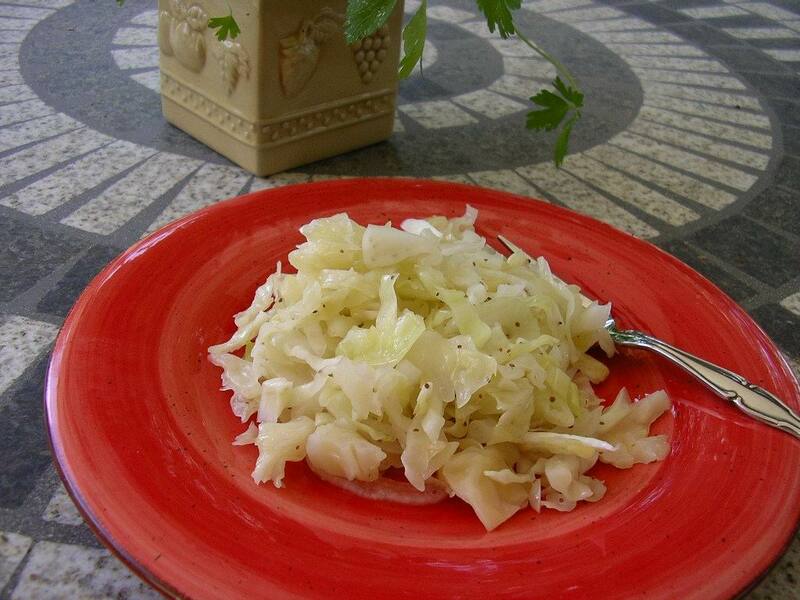 A favorite cabbage dish of his is haluski, cabbage and onions fried in butter and tossed with egg noodles, although I understand there are lots of variations. With or without potatoes or meat. 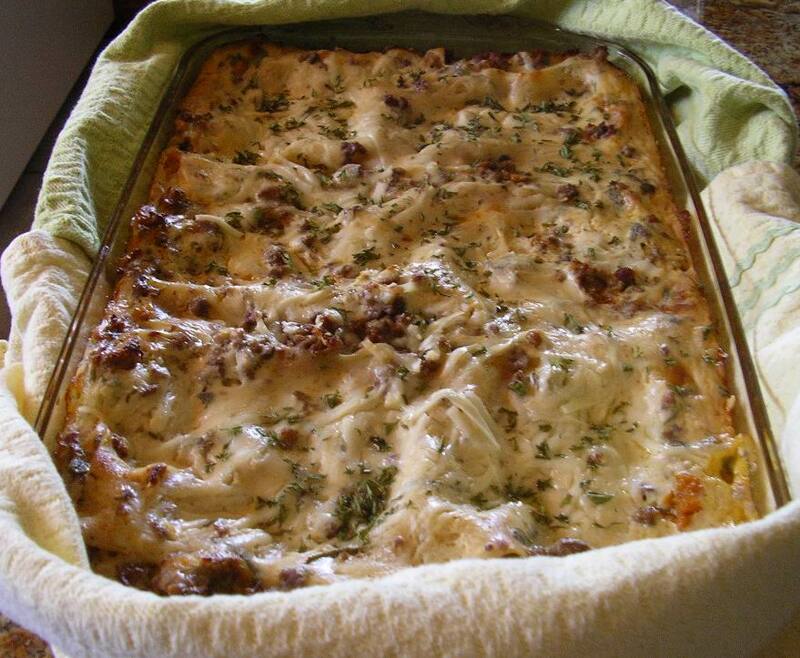 Whatever way it’s made, it’s great comfort food and very easy. Knowing my husband likes cabbage so much, I grew it in my garden last year. While it was good, I honestly thought it a waste of garden space, since I only got one per plant and they’re relatively cheap year-round, and especially this time of year. I like cutting the cabbage head as thin as I can with a knife, about 1/8th of an inch. The box grater shredded it too fine, and the slicer with the food processor, too thick. Some things are just better by hand. Heat all of the above to a boil; let cool slightly. Shred (or slice thinly!) one head cabbage and spread in a large casserole. 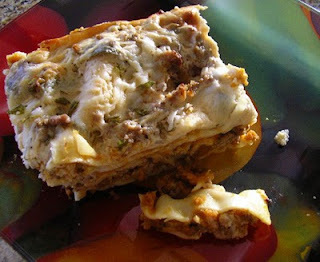 (A lasagne pan, a glass one, not metallic, works great.) Slice one onion and spread over the top. Sprinkle ¾ cup sugar over the onion layer. Pour the dressing over all, cover and let sit in the refrigerator for 24 hours. Mix together and serve.